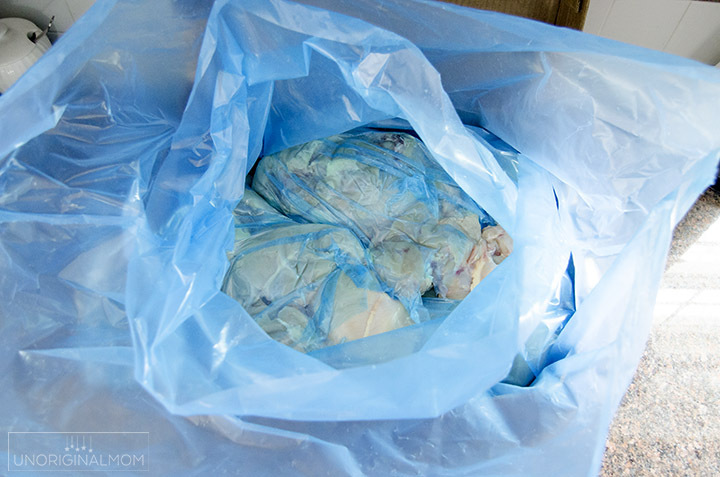 Chicken Freezer Prep Ideas: What to do with 40 Pounds of Chicken! UPDATE: Several months after I published this post, in June 2018, Zaycon suddenly went out of business with no warning to anyone. Due to some changes in their business management, I stopped recommending them a month in advance of their closing, but I truly had no idea this was coming. I am really saddened by the whole thing – not only for the customers that lost money on pending orders but also for the loss of such a convenient service. I debated whether or not to simply delete this post, but I decided to leave it published – even though purchasing meat through Zaycon is no longer an option, many of these tips and ideas are helpful for processing chicken breasts in bulk from the grocery store. If you follow my Instagram stories, you know I recently purchased a 40 – yes, that’s not a typo, FORTY!! – pound box of boneless skinless chicken breasts from a company called Zaycon Fresh (no longer in business). I made a plan, spent a few hours in the kitchen, and was able to stock my freezer with chicken prepped for 25 meals for just $40!!! I’d say that was totally worth the time, money, and effort that went into it. 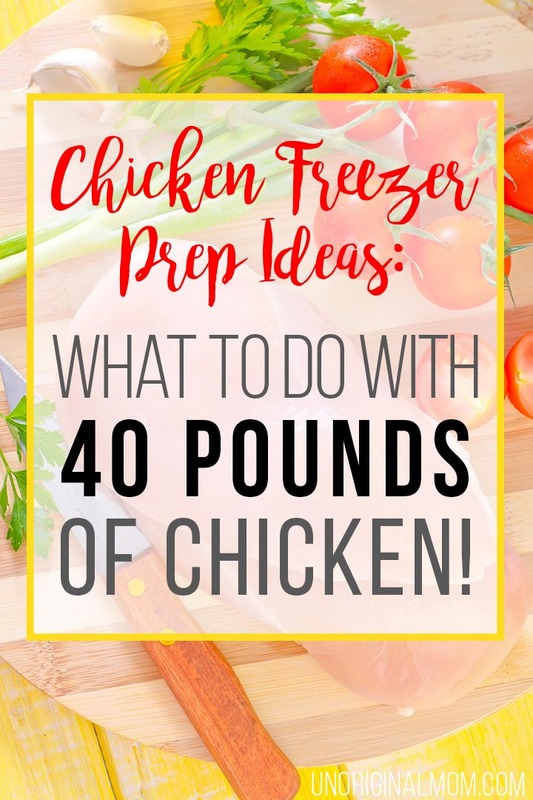 So, if you want to buy chicken in bulk, here are my suggestions on chicken freezer prep ideas and what to do with 40 pounds of chicken! A quick note: this is NOT a sponsored post – just an honest review. 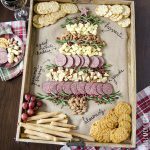 This post does contain affiliate links to services and products I have personally used and recommend to my own family and friends. Click here to read my full disclosure. 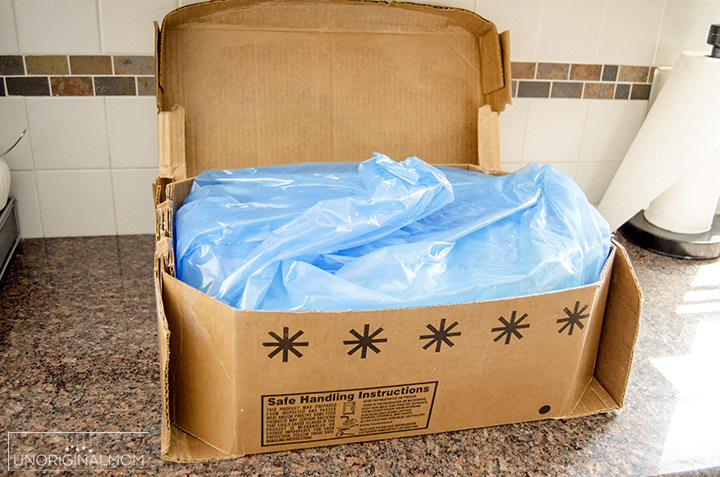 The thick cardboard box that we picked up contained several bags of raw boneless skinless chicken breasts that were then double bagged in super thick, blue plastic bags. No way any chicken juice was leaking out of there! This chicken I got was NOT prepped in any way. If you’re buying directly from a supplier or from a farm, you might experience something similar. Most of the chicken came as two whole, untrimmed breasts that were still butterflied together. I knew all this going in and was prepared accordingly. Luckily, we have a second refrigerator in our basement, so rather than having to bring the chicken home at 5:30 and deal with it that evening I stuck the whole box in the fridge and waited until the next afternoon to tackle it. disposable gloves (several pairs) – certainly optional, but these were really handy to be able to stop and take a break (like when my usually-2.5-hour-napping-son woke up after 45 minutes). I still scrubbed my hands and arms after I took them off, but at least I didn’t have to worry about under my fingernails, ew. Once I had everything ready, I put my 3 year old down for a nap, turned on some music, got out the box-o-chicken and started trimming. This is where the 3 large bowls were really handy – I used one for fat/trimmings to discard, another for the tenderloin/cutlet underneath the breast that I cut off (you don’t have to do this, but I found that to be easiest for the way I was prepping my chicken), and another for the trimmed whole breasts. I pretty much cut it exactly the same way as the first half of this video shows, but I stopped with the whole breasts rather than slicing them up. I was really impressed with the size and quality of the chicken breasts- I really didn’t have to trim off that much fat! I weighed my “trimmings” bowl at the end, out of curiosity, and I trimmed off about 4 pounds of chicken and fat – and I was trimming VERY liberally. If I’d been a bit more conservative (and had a better quality knife), it probably would have been closer to 2 – 2.5 pounds. 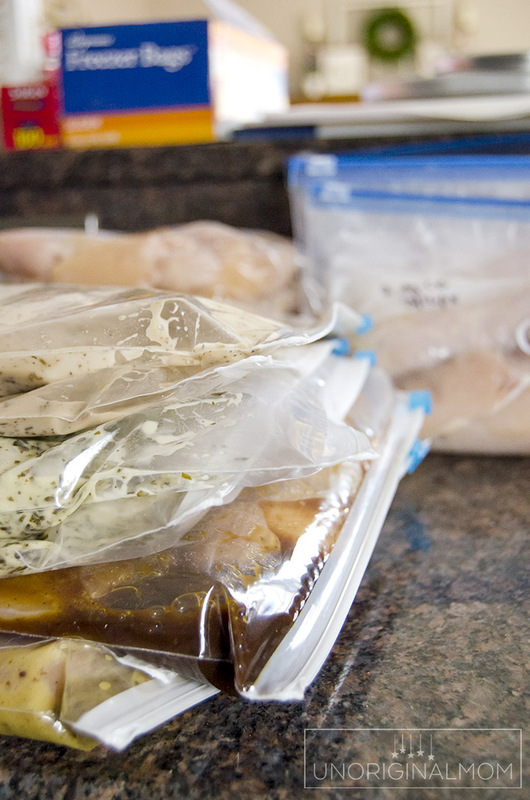 You can stop there if you want – just package up all your trimmed chicken breasts and tenders into freezer bags and stick in the freezer! But I went a few steps further to prep the meat in a few different ways – since I already had all the chicken out and the kitchen was a mess, I figured it was worth a little bit of extra time now to save a whole lot of time in the future. 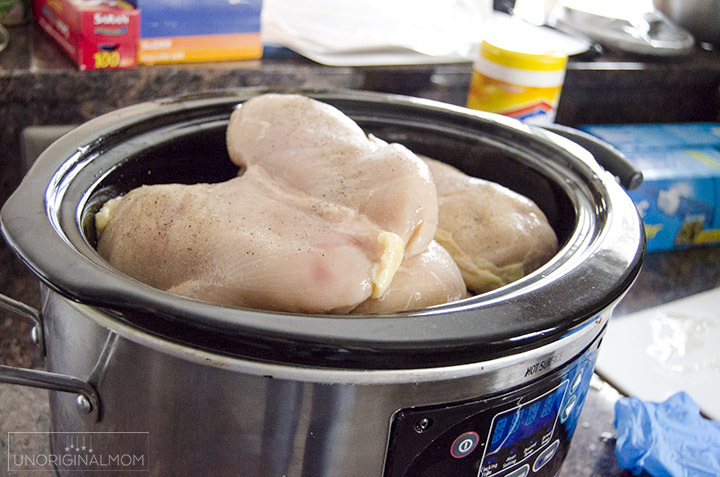 Read for some chicken freezer prep ideas and to see what I actually did with all that chicken! 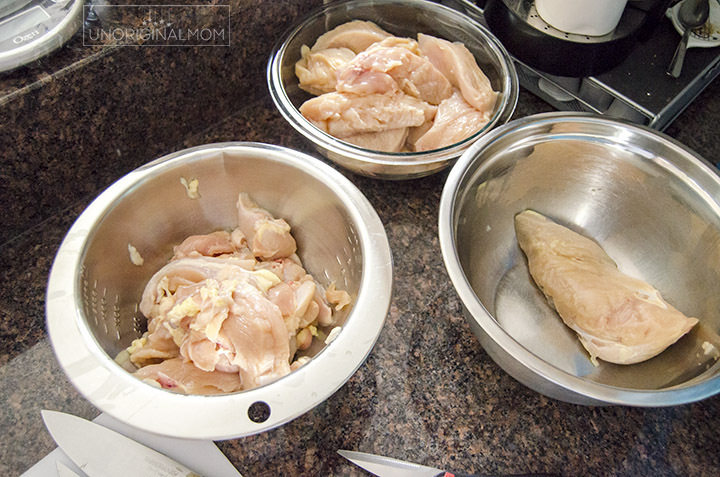 CHICKEN FREEZER PREP IDEAS: Here’s what I actually did with all my chicken! 1. EIGHT bags of shredded chicken. The chicken inside the box and big bags was divided into four smaller bags. I actually took one whole bag and just dumped it straight into my crock pot. I seasoned them with salt, pepper, garlic powder, and onion powder, and then added a few cups of chicken broth. I set it to cook on high while I dealt with the rest of the chicken. After about 5 hours or so, I checked to make sure it was done, and then used my KitchenAid mixer with the paddle attachment on low to shred the chicken a few breasts at a time. Presto, shredded chicken! I divided them into 2 cup portions and froze in quart sized bags. 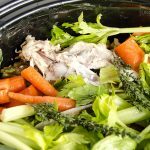 Shredded chicken is great for using in soups, casseroles, sandwiches, dips, tacos/quesadillas, and more. 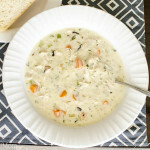 (If you’re looking for ideas, I actually have a few posts with great one-dish dinner ideas for shredded chicken, soups to make with shredded chicken, and other meal ideas for shredded chicken.) In hindsight, I do wish I had done a little bit of trimming with this chicken before I dumped it in the crock pot. I wouldn’t have had to be very careful, but I ended up having to pick out some tough bits of meat that didn’t shred well which likely could have been avoided if I’d spent an extra 10 minutes trimming that chicken. 2. EIGHT bags of marinade packs. 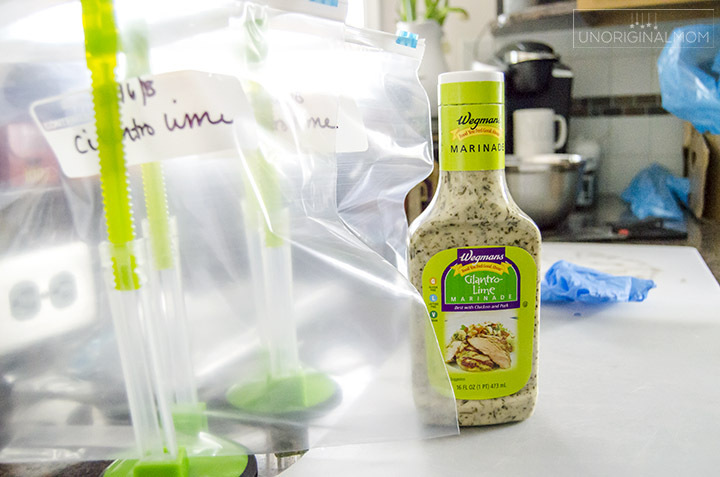 I LOVE making freezer marinade packs through the spring and summer – it’s such a convenient, fast, and healthy way to meal prep! I took some of my trimmed chicken breasts, cut them into 4-5 smaller cutlets, then pounded them to an even thickness. I put about 5-6 cutlets in a gallon ziplock freezer page, then poured half a bottle of store-bought meat marinade on them. (You can find bottled marinades in your grocery store near the salad dressings.) You could also use homemade marinades, but I wanted to keep things simple. Now, when I take the bag of chicken out of the freezer, it will marinate as it thaws and I can just throw it on the grill for dinner! I like to serve up the grilled chicken with some roasted fresh veggies and a salad for a super nutritious and delicious supper, or on top of a big green salad for a light supper or yummy lunch. We also love using a southwest-style marinade and then adding the grilled chicken to burrito bowls with cilantro-lime rice, roasted corn (which I buy frozen from Trader Joe’s), pinto beans, tomatoes (or pico de gallo), lettuce, cheese, and sour cream. 3. FOUR bags of cubed chicken. I took the tenderloins that I’d cut off the underside of the breasts (remember, I put those in a different bowl than the breasts) and sliced them into small chunks for things like stir fries, homemade chicken nuggets, and lots of other recipes that call for cubed chicken. (I just used a bag in this delicious chicken bacon broccoli pasta the other night!) You could easily do this with breasts as well. I used quart sized bags and put 1.5 lbs of cubed chicken in each bag, though in hindsight I wish I’d done 1 pound. I’ve used them in a few recipes and 1.5 pounds is just a little too much for our small family. If you’re not sure how much to put in each bag, it’s always good to do smaller portions…do a few one pound bags and a few half pound bags, so you can easily pull out whatever combination you need for the meal you’re making. 4. FIVE bags of whole chicken breasts. For recipes that need some other variation of chicken, I just took the rest of my trimmed whole chicken breasts and put two to a quart-sized bag. 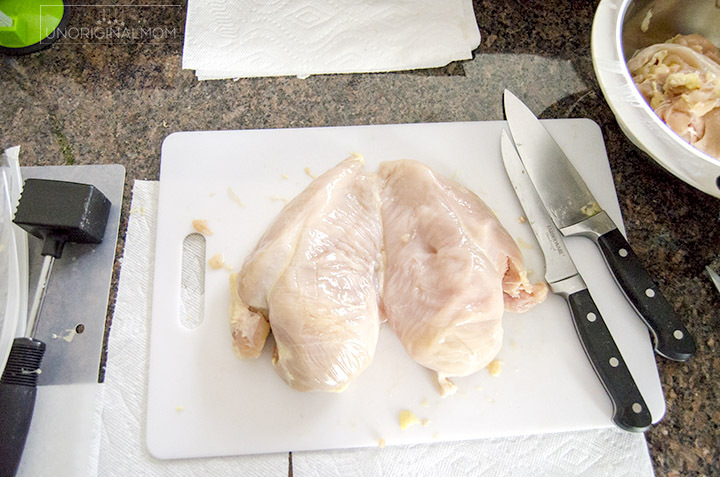 I’m realizing now though that I very rarely use whole chicken breasts, so I wish I had done more cubed chicken or even pounded some of them out into cutlets before freezing…but no big deal, it’s easy enough to thaw the whole breasts and then cut them however I need. Now, it’s important to note that I’m cooking for a family of 4 with two adults and two children under the age of 6. My kids aren’t huge meat eaters, either. So my “meal portion” sizes are likely a bit smaller than that of a family of four with older kids, or families with more than two children. Obviously, you’d need to plan your portion sizes according to the amount of meat your family eats at each meal. But the beauty of prepping chicken in bulk like this is that you can do it however you want to! 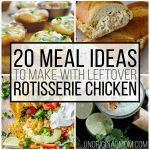 Those are just a few chicken freezer prep ideas for you! Of course, you can do whatever works for your family. Would I do this again? Yes, I think I would. The price is great and the quality is really good – we’ve had a few meals now with this chicken and it’s delicious. Also, spending the afternoon prepping this chicken, while it wasn’t the most fun thing in the world, will be saving me lots of time and energy over the next few months as we use up our freezer chicken stash. 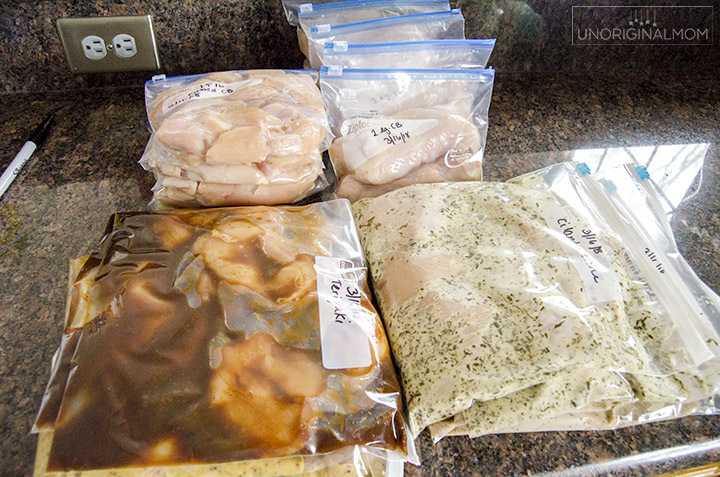 Have you ever tried preparing chicken for the freezer in bulk before? Do you have any good chicken freezer prep ideas or tips to share? Leave a comment and let me know!